List of 19 frequently asked questions. The focus of the Language Arts program in grades three through five is on building upon the foundational skills in reading, writing, listening, and speaking that began in the primary grades, and supporting students as they transition from learning to read and write to reading and writing to learn. The focus is on deepening comprehension. Students read increasingly complex texts with challenging themes and vocabulary, and receive guidance as they read independently and within teacher-led and student-led book groups. 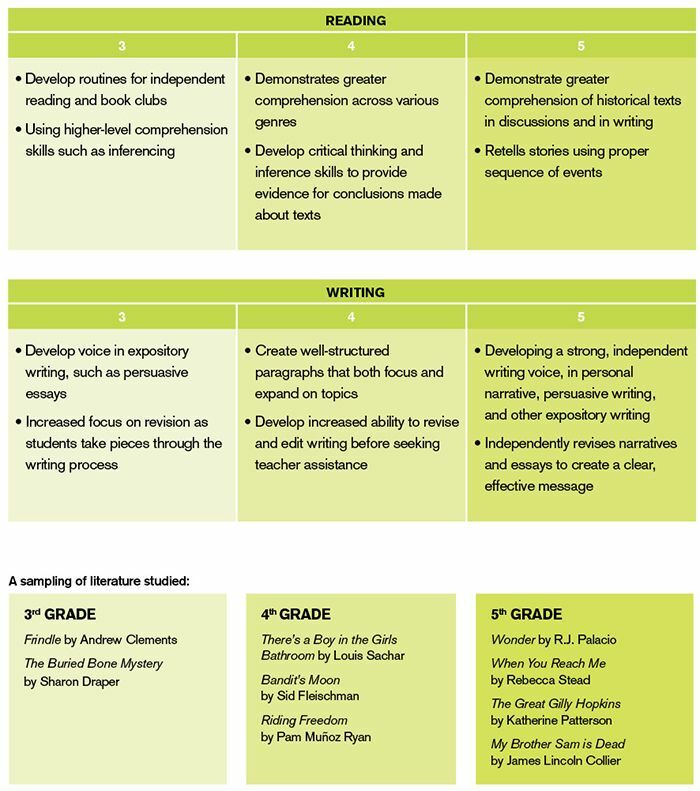 The writing program encourages students to write at length in a variety of genres, and to move deftly through each stage of the writing process, incorporating the feedback of their teachers and peers. Upper Elementary students build on the foundation provided by the Sound Steps to Reading program in grades K-2, using their extensive understanding of sound/letter relationships in both reading and writing activities. Third through fifth grade classrooms utilize the Reading and Writing Workshops developed at Teachers College, Columbia University. The goal of these workshops is not simply to create students who read and write, but students who ARE readers and writers. During these workshops, students practice reading texts at their independent level, read in teacher-guided book groups, write original pieces, and receive feedback and guidance from teachers towards producing a clear message. The skills listed below are a sampling of some of the main expectations we have for our 3-5 students in reading and writing. Assessments are ongoing, and students acquire skills and proficiency at different rates. The focus of the mathematics program in the Upper Elementary grades is on building upon the solid foundational understanding of number sense, geometry and measurement, and statistics and probability established in the primary grades. Our math curriculum is primarily driven by the University of Chicago’s Everyday Mathematics program, which provides extensive, research-based activities differentiated for a variety of learning styles. Our teachers have also been trained in Cognitively Guided Instruction (CGI), an approach to teaching mathematics that encourages listening to children’s mathematical thinking and using it as a basis for instruction. Our Upper Elementary math curriculum continues to encourage students to explore strategies for building conceptual understanding and solving problems, and also supports a greater understanding of how mathematics is interwoven into other related disciplines such as science and maker. The skills listed below are a sampling of some of the main expectations we have for our 3-5 students in mathematics. Assessments are ongoing, and students acquire skills and proficiency at different rates. Upper Elementary students at The Willows build on the foundational concepts explored in the primary grades in order to develop scientific skills related to inquiry, observation, data collection and interpretation, and research. Students use the scientific method as they formulate hypotheses, conduct experiments, and form conclusions based on evidence. The Lower School science curriculum is based on the concepts and skills suggested by state and national standards and is incorporated into several interdisciplinary thematic units throughout the school year (listed below). Science in the Upper Elementary grades encourages students to begin to understand how various interrelated systems on Earth and our universe work. More extensive experience is provided with data collection and interpretation, as well as research opportunities on several topics within one unit of study. In the Upper Elementary grades, our social studies curriculum builds on the foundational concepts related to community explored in the primary grades, and begins to expand its scope to include more in-depth studies of local, state, and national issues related to the past and present. A focus is placed on developing critical thinking skills and understanding history. The Lower School social studies curriculum is based on the concepts and skills suggested by state and national standards, and, like science instruction, is incorporated into several interdisciplinary thematic units throughout the school year (listed below). In addition, Field Trips are integrated into the units of study. In order to strengthen connections to the values of our local communities and engage students in the concepts of the curriculum on a deeper level, each grade level participates in a community service project in partnership with a local service organization. Third through fifth graders partner with an organization called Culver City Backpacks for Kids, which works to solve weekend food uncertainty issues throughout Culver City schools. At The Willows, we have long embraced technology as a tool for learning, promoting the idea that students use technology to be more creators than consumers. Further, our interdisciplinary, project-based approach has long valued integrating technology into all disciplines and classrooms, not keeping it isolated in a computer lab which students only visit occasionally. Inspired by the design thinking work from Stanford University’s d.school as well as our ongoing work with maker and our makerLabs on campus, we believe our approach to interdisciplinary learning can best be summarized as STEAM2 – incorporating Science, Technology, Engineering, Art, Math, and Maker into a myriad of projects and schoolwide efforts. BeeBots, as well as BlueBots, introduce our youngest students to the basics of programming as a written language. They begin basic programming (forward, backward, turn right or left) in Developmental Kindergarten or kindergarten by entering a series of commands and pressing a button to execute the program going from point to point. They plan, revise, and execute. Next, they navigate mazes and learn to solve challenges. Thymio is a versatile robot that has a wide range of how it can be used at different grade levels. Our 3rd to 5th grade students use block-based and visual-based programming language to navigate mazes and to adapt to a changing environment. For example, the 4th graders programmed Thymio to respond to a change in the environment as part of their Animal Adaptations Unit. The Lego Mindstorms EV3 are used in grades 5th through 8th to build, program, command, and control robots. Students perform more sophisticated tasks as they program EV3’s to drive, walk, slam, and spin. Students think creatively and reason systematically as they use EV3. The Middle School Robotics Team builds and programs the EV3 robots to autonomously complete tasks during competitions. Vex Robotics, used extensively in our Maker curriculum, offer our students a snap-together robotics system to work as engineers designing from the ground up and programming. The robots are built from kits with hundreds of pieces and more than 100 steps to build them. Once built, students program the robots using Modkit programming using block-based coding to travel in straight lines, make turns, and pick up blocks. Advance students successfully build obstacle courses and challenges that their robots can complete by pushing a button to execute the coding. Each Willows student is a musician. We want every student to develop the basic skills to make and enjoy music. A wide variety of opportunities are offered to accomplish this goal ranging from singing and playing to understanding and creating to appreciating and performing. The Music Studio - A vibrant, Mini “Orffestra” We use the Orff-Schulwerk approach as a foundation for our music curriculum allowing students to participate fully in the musical experience as they learn to listen and play individually and as an ensemble. With Orff instruments (xylophones, metallophones, glockenspiels) recorders, drums, and other percussion instruments in hand, our students build foundational skills. Additionally, through songs, poems and chants, body percussion, creative movement and dance, students have opportunities to experience music within themselves. This encourages them to become expressive musicians who listen and compose thoughtfully and improvise freely in song, movement, and instrument playing. As students progress through the grades, their level of sophistication in musical skill and understanding increases. Recorder and Ukulele Building upon their musical foundation and mastery of Orff instruments, Upper Elementary students are offered more sophisticated music experiences. In third grade students are introduced to the recorder, and in fifth grade, students begin instruction in ukulele. By learning how to play a new instrument, students extend their music reading skills, and build a repertoire of songs. Electronic Music Third through fifth grade students meet once a week in our Electronic Music Lab, where they compose and record original music using GarageBand. With teacher direction, students put virtual instruments into action, working individually and collaborative to explore the musical elements and musical articulation. They gain a foundational understanding of music theory and composition in this dynamic class. Choir Our outstanding choral program includes five choirs spanning kindergarten through eighth grade. The Willows Upper Elementary Choir is open to students in 3rd through 5th grade. Performing with a choir allows our students to develop their singing voice in a large group setting and share their work with an audience. Being in choir extends their musicianship skills while they encounter a wide variety of musical styles and learn to sing in unison and 2-part harmony. The choir performs a Winter Concert and Spring Concert each year. Our visual art classes aim to develop understanding and enjoyment of art, and to encourage students to observe, record and wonder about the world around them. Art is a way to process thinking about our world. Students discover techniques and skills to express themselves visually. Projects often connect with other areas of the curriculum and we begin this year exploring the school-wide theme of “Story.” We aim to develop students’ visual literacy through on-going discussion about their own work and that of others. Visiting art galleries and museums incorporates first-hand study of artwork from different cultures and time periods. A wide range of media is explored including, painting, drawing, textiles, digital media, ceramics, sculpture, printmaking and photography. We place as much emphasis on the artistic and creative process as the final product. Whether working collaboratively or individually, our goal is to empower students to see, to feel, and to create. Drama is an art form through which students develop awareness and empathy, heighten their perception and cognition, learn to manipulate language and movement, and improve their ability to function comfortably in front of others. Designed to spark the imagination and recognize each child’s creative voice, Upper Elementary Drama program and performance opportunities are integrated into classroom curriculum. Creative dramatics, class plays, musicals, and dramatic productions are presented as part of our curriculum. Highlights include the 4th Grade Gold Rush Musical and the 5th Grade Play. Dance is a key component of our Performing Arts Program for Upper Elementary students, offering them an opportunity to express themselves creatively through movement while boosting confidence. Dance performances are integrated into school life. Dancers often collaborate with music students who sing or play instruments and with art students who create costumes. Willows dancers perform throughout the year at special school functions and community events such as Poetry Night, Family Arts Night, and Grandparents’ Day. The annual celebration of dance is a culmination of the year in dance. Students of all skill level and experience participate in dance through weekly P.E. classes starting in 5th grade and Enrichment classes in 3rd to 5th grade. In 3rd-5th grades, poetry combines the excitement of self-expression with a growing sense of craftsmanship. By upper elementary our students are used to reading and writing poetry, so we can dive into elements like rhythm, repetition, voice, and economy of language. Movement warm-ups jumpstart creative thinking and facilitate the flow of words and feelings onto the page. Each week, poets are encouraged to share their work aloud. This practice nurtures social-emotional-cognitive skills as students listen with attention, embrace their own ideas and those of their classmates, and give precise, positive feedback. Editing and revision highlight an attention to themes and details, and classroom teachers continue to explore poetry with their students once this five-week unit is complete. Every student has an individual poem published in the school poetry anthology, which coincides with Poetry Night—a beloved Willows tradition. At this very special event, each grade level performs on stage, and then students return to their specially-decorated classrooms to read individual poems and celebrate their success! The Willows Gardening program takes our students on a journey from seed to table and beyond. The program augments our science curriculum and enhances our students’ experience with the natural environment and the cycle of life. The organic curriculum is as much about learning to grow vegetables such as broccoli, carrots, chard, beets, peas, lettuce, and kale as it is about providing students with a deep connection to understanding where their food comes from and an awareness of the impact each of us has on our planet’s resources. Goals of the program are to leave children with the magic and thrill of the natural world, teaching them that there is so much happening underneath the surface and when we care for that, the possibilities are endless. The gardening curriculum, taught in a developmentally appropriate way for Developmental Kindergarten through fifth grade, is most definitely experiential with our students getting their hands dirty and tasting the delicious vegetables, fruits and herbs the garden produces. It includes the study of planting and caring for seedlings, sowing and harvesting, seed saving, seed starting, germination, worm farms, composting, beneficial bugs, garden pests, companion planting, pollination, edible flowers, life cycles of plants and trees, evergreen and deciduous trees, and crop rotation. In addition, students learn about different cultures and foods grown and eaten in different parts of the world. Walk by our garden during a class, and you are also sure to see students measuring or drawing pictures. This documentation of the garden is an integral part of the gardening curriculum, which teaches the life cycle of plants and trees but also illustrates the integration of our garden into classroom curriculum. Students map and measure the garden throughout the year in developmentally appropriate ways for each grade level. They draw the garden in fall, winter, and then in spring when the plants are in full bloom to see a full growth cycle. Students in the gardening program grow, weed, harvest, and cook their way through each year, helping students see the full picture of seed to table. By tending and nurturing the garden, and taking a seed and helping it grow, a student can see what is possible for all of us. The Physical Education Program at The Willows is designed to develop and strengthen students’ athletic skills while promoting self-confidence, sportsmanship, and a healthy lifestyle. Students participate in P.E. classes, receiving a combination of whole group, small group, and individual instruction to best meet each individual’s needs. Throughout the year, students participate in activities that strengthen motor skills and foster team spirit We emphasize the importance of personal health and encourage students to focus on lifetime activity skills. Our goal is for students to develop both skill and confidence–important tools that students need to remain physically active and healthy throughout their lives. In third grade, students reinforce skills learned in previous years and build new skills. At this age, we believe students are ready for structured, healthy competition, and to that end emphasis shifts to team sports and activities, while still providing students opportunities to practice manipulative skills (throwing, passing, catching, etc.) in isolation. In fourth and fifth grade, students reinforce skills learned in previous years and build new skills. At this age, we believe students are ready for structured, healthy competition, and to that end emphasis shifts to team sports and activities, while still providing students opportunities to practice manipulative skills (throwing, passing, catching, etc.) in isolation. Students from The Willows have the opportunity to compete against other Los Angeles schools. Beginning in fourth grade, students are encouraged to participate in after-school sports regardless of previous experience or expertise. Our “everyone plays” philosophy for Lower School physical education classes also applies to after-school sports. In the fourth and fifth grades, in particular, we emphasize participation and the fundamental skills of each sport. Our goal is to promote cooperation, team spirit, fun, and good sportsmanship. Our Library is at the heart of our campus, a hub for collaborative and cross-disciplinary learning. With more than 27,000 resources including books, playaways, online audio books, ebooks, e-readers, and online databases. The library program is sequentially integrated with each grade level’s curriculum. Upper Elementary students visit the library once each week for activities that build understanding of information literacy. Students continue to build research skills, often with projects that connect to their classroom explorations such as Native Americans in third grade, Space in fourth grade, American history in fifth grade, and other topics. There is an “open door” policy for 3 – 5th graders. By fifth grade, students are capable of using the library on their own because they have a working knowledge of the library computer system and the various organizational systems of the library. 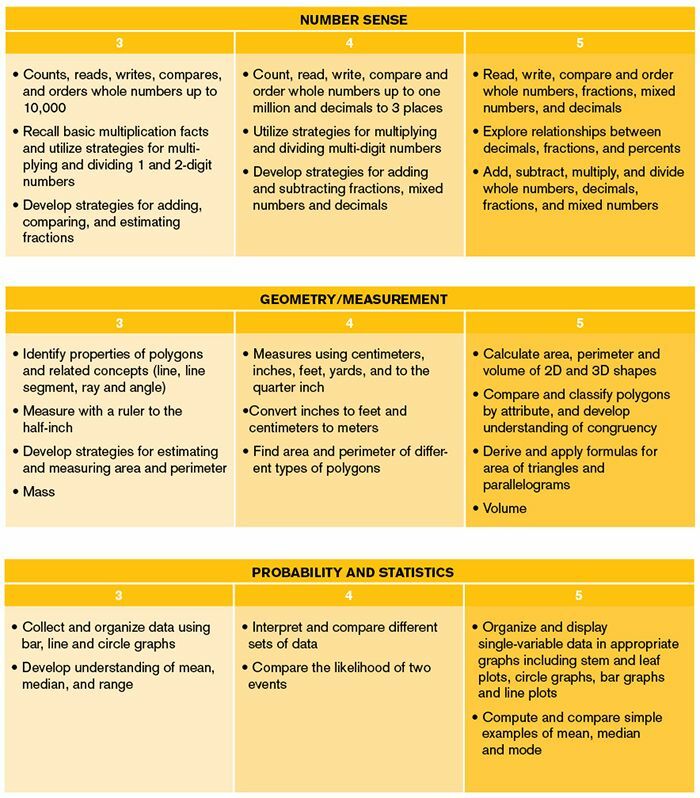 RULER integrates these skills into the academic curriculum and provides opportunities for students and all the key adults involved in their education – teachers, administrators, and family members – to learn and apply these skills. Decades of research shows that emotional intelligence is essential to effective teaching and learning, sound decision making, physical and mental health, and success in school and beyond. Research also shows that when schools and homes partner to support children’s emotional development, children not only feel better, but they do better. In the 3-5th grade classrooms, teachers build upon the foundations of the RULER skills and Anchor Tools students learned in the beginning years at The Willows. They take students deeper with the Feeling Words Curriculum and integrate literacy and character analysis with the RULER anchor tools. Teachers expand upon the Meta-moment, which is a unique process for effectively managing the space-in-time between the emotional trigger and the response. Students discuss effective strategies vs. ineffective strategies related to topics such as test taking, preparing for sports competitions or performances, etc. Teachers help each student build and add to a students’ toolkit of regulating strategies. As peer relationships become more complex, teachers support students in solving problems, making good decisions, and resolving conflicts and challenges. We’re proud to be a school community who understands that “emotions matter” and that how children feel has profound implications for learning, success, and wellbeing. Our goal is to equip The Willows children for success today and for life. Each school year since 2000-2001, our faculty and students come together across grade levels to explore a school-wide theme. Launched each fall, the annual theme is incorporated into curriculum through classroom projects, the arts, and athletics. Story is the 2018-2019 school-wide theme. Cross-curricular connections and flexibility are key components of a Willows education. Intersession is a one-week, inter-disciplinary, multi-age exploration of a single topic. Intersession provides an opportunity to explore a new thematic idea throughout the Lower School. The theme is applied to the central academic subjects. This year’s intersession topic is our school-wide theme, Story, which will provide a rich basis for studies. The purpose of assessment at The Willows is twofold: to determine whether individual students are developing and mastering grade level skills at an age appropriate pace, and to identify ways our curriculum can be refined or differentiated to best meet our students’ needs. Rather than judging student progress only through standardized or traditional tests, teachers work closely with administrators to track student learning through a thoughtful combination of quantitative assessments such as short and long-answer tests, qualitative tools like personal reflections and written responses, project-based presentations, portfolios, classroom observations, and one-on-one oral and written evaluations. The results of these comprehensive assessments are communicated to parents in a variety of ways. Parent-teacher conferences are held in November, March, and June, and written evaluations are sent home before the first and final conferences. Each evaluation is comprised of several descriptive narratives on core subjects as well as social-emotional observations. Beginning in third grade, conferences held in March are led by students. This is a unique opportunity for students to develop ownership and voice regarding their learning, as they share their perspective on their growth and goals going forward. Students are also at the forefront in leading yearly Exhibitions, where they have an opportunity to share projects with the school community, with an emphasis on process and making learning visible to others.